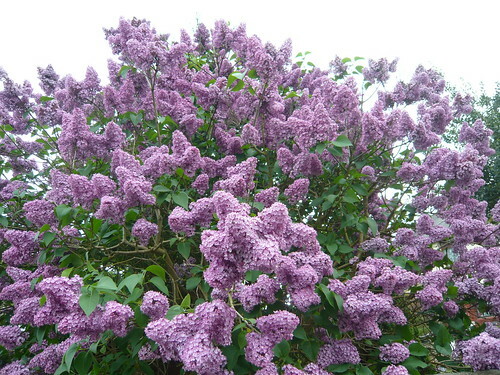 Lilacs (Syringa vulgaris ) are one of the most rewarding spring or early summer flowering shrubs. It rewards us with the most delicate fragrance and beautiful flowers. Even when not in flower, the lilac makes a nice attractive deciduous, green leaved shrub, that can form part of a hedge or shelter the garden. Lilacs do not like waterlogged soil. It is important to plant in a relatively free draining soil. They can tolerate hot sun and heat (and can provide a nice dappled shade for the rest of the garden. In long periods of drought, it may be necessary to water. Make sure the water gets deep down. Lilacs are not heavy feeders. In good soil, a general purpose fertilizer once a year, will be adequate. Be wary of too much nitrogen as this can lead to green growth at the expense of blooms. Lilacs send suckers from the base. These are vigorous growers and can be separated from the main bush to create new plants. A cheap and easy way to propagate. 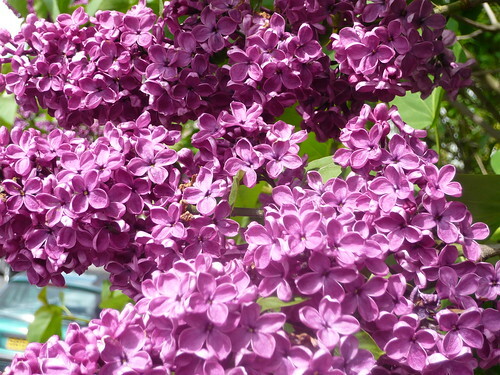 Lilacs remain relative pest free. I have never had any aphids with my lilacs. Lilacs can be subject to powdery mildew, especially when hot and humid. The best treatment for powdery mildew is removing affected leaves and burning, and treating with suitable fungicide. Do not prune at the wrong time or you will stop the flowering. Lilacs should be cut after blooming. Common Lilac or French lilac grow about fifteen feet tall with a spread of 8-10 feet. Lilacs have large clusters of flowers in a pointed cone shape. They are available in varieties with pink, white, blue, purple, flowers. 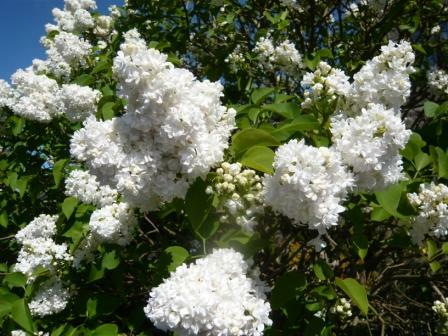 Korean lilacs are shorter more rounded with small leaves and extremely fragrant flowers.